It’s not an uncommon occurrence for a teenager to need some counseling. After all, teen years are turbulent and come with huge physical and mental challenges. Just about 10% of American children between the ages of 3 and 17 saw a mental health counselor in 2016. But contrary to popular belief, teens don’t always fall for the ‘everyone is doing it and you can too’ theory. When you’re trying to get your teen in for youth counseling services, they may be resistant and need careful convincing. Here are a few suggestions to help you move them forward. Much teenage rebellion stems from their perception that they are not being heard or respected by authority figures around them. 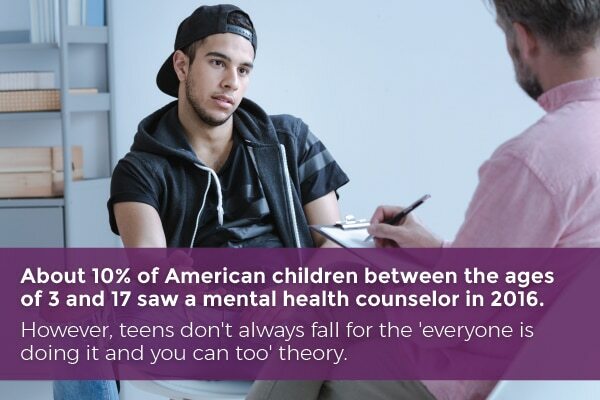 Regardless of whether this perception is accurate, they might resist your honest help based on the feeling that you do not know what they are ‘going through.’ Even if you do believe you understand the mental or emotional challenges your teen is facing, try telling them that! We bet you’ll get disbelief back, right? Sit your teen down. Ask them to describe what they are going through. Don’t interrupt, not even once. Wait until they are done talking. Explain that, as a parent, you don’t necessarily understand everything they are feeling, and you don’t necessarily have the tools to help, but a therapist has many more tools to potentially help them. If you acknowledge to your teen that their emotions can be a mystery to you and but you still respect them, they may be more likely to take the help you’re offering, even in the form of youth counseling. Like any mental health service, accessible youth counseling and mental health services for children can be limited, depending on your area code and insurance. However, if you have the means to be choosy about what counselor you send your teen to, ask them to help pick one out. If your teen doesn’t feel comfortable with the counselor they are seeing, they probably won’t make much progress. Give them a say in the decision-making process, and they might open up a bit faster to their counselor. Ultimately, your teen’s sessions are between them and their counselor. You might be able to ask for progress updates, but your teen may be more comfortable keeping most of their sessions and progress private. It’s difficult as a parent to not be offended by this, but remember that teens often demand this kind of privacy and independence. It feels personal, but rest assured it’s usually not. Reassuring your teen that they have privacy with regard to their treatment allows them to have some autonomy while growing in their therapy. If your teen is comfortable with group family therapy, a session or two of that may be helpful to facilitate communication within the family. However, your teen’s development of a healthy professional relationship with their counselor is important. Allow them the privacy to do so. It’s not easy to watch your child go through difficulties in life. Remember that everyone — from their school counselor to their professional therapist — is committed to supporting them. You don’t have to handle their struggles alone. Contact Keri Powell Therapy to learn how we can help. Previous post: Premarital Counseling: How Will it Benefit You and Your Partner?